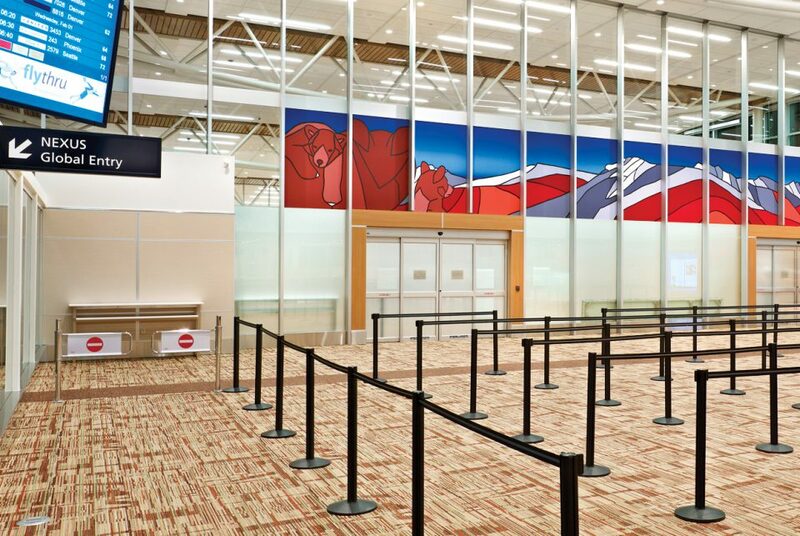 If you’ve been to the Edmonton International Airport, chances are, you’ve seen this stunning mural. The piece is hard to miss, spanning 100 feet across and featuring prominent black lines and deep hues, a signature of Carter’s work. This particular piece features the Old Man Mountain range in Jasper flanked by a mother bear and her two cubs looking out towards to the viewer. From the ground staring up, it truly looks as though the mountains are towering over you under a clear blue sky. The painter and sculptor is often influenced by nature and says that, as he currently lives in Canmore, being close to wildlife definitely has an impact on his work. Installed in 2011, the piece not only pays tribute to the sprawling natural beauty in the area but also to Carter’s Indigenous heritage as part of the Little Red River Cree Nation. According to the Edmonton International Airport’s website, there were many Indigenous people that used the valley of the mountains for over 9,000 years as a meeting place with other groups. The piece was chosen in part because of Jasper’s proximity to Edmonton; Carter says the park is our city’s “unspoken playground.” However, “Old Man Mountain” is just one of three pieces that Carter proposed to the EIA including a prairie scene with cows and another mountain range in the Bow Valley in Canmore. The painting was originally done with acrylic on canvas which was then transferred onto a film that could be attached to the glass window, letting light shine through the vibrant colours. Carter graduated from MacEwan University’s Digital Arts and Media program in 2003 and was presented with a Distinguished Alumni Award last year. His work has been featured across Canada and appeared in the Edmonton community several times including the Art Gallery of Alberta’s TREX program and the LRT Extension beautification project.